Paradox Converter is a versatile yet easy-to-use conversion program. It has a familiar Wizard-like interface but can also be used as a command-line utility for batch file processing. 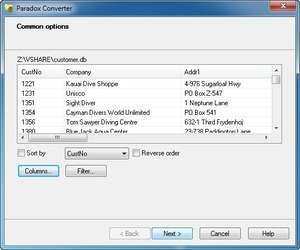 Paradox Converter supports all the modern data interchange formats, such as DBF, XLS, XML, CSV, TXT, HTML, RTF, PRG and others. You can even convert your DBF table into a SQL script. Paradox Converter 2.29 is a shareware program and can be used as a demo to try the software until the free trial period has ended. A full version of the program is available after the trial period ends. For security reasons, you should also check out the Paradox Converter download at LO4D.com which includes virus and malware tests. Additional screenshots of this application download may be available, too.